Afghan authorities this week shut down two private security companies and said more than 10 others, some suspected of murder and robbery, would soon be closed, Afghan and Western officials said Thursday. A Western security official, speaking on condition of anonymity because of the sensitivity of the issue, said some major Western companies were on the list of at least 10 others tapped for closure, but would not give names. The crackdown echoes efforts by authorities in Iraq to rein in private security contractors often accused of acting with impunity. Blackwater guards protecting a U.S. Embassy convoy in Baghdad are accused of killing 17 Iraqi civilians in a shooting on Sept. 16, an incident that enraged the Iraqi government, which is demanding millions in compensation for the victims and removal of Blackwater in six months. The Associated Press has reported that the State Department, reacting to the Blackwater shooting, is considering limiting or phasing out the use of private security contractors to guard U.S. diplomats in Iraq. However, a state department official, speaking anonymously to CBS News correspondent Kimberly Dozier, said replacing private contractors with government Diplomatic Security agents would be difficult, as the department is already fighting manpower issues trying to get just one government agent into each convoy. "We used to have agents in every vehicle ... and cameras and recording equipment," the source told CBS News. Dozier learned that came to a halt little more than a year ago, when the last head of diplomatic security decided to end the oversight of the private guards due to a manpower shortage. They had also lost three agents, and didn't want to lose any more, according to the source. The Blackwater incident in Iraq, followed by another shooting involving an Australian-run security firm that left two Iraqi women dead, has focused attention on the nebulous rules governing private guards and added to the Bush administration's problems in managing the war in Iraq. Dozens of security companies also operate in Afghanistan, some of them well-known U.S. firms like Blackwater and DynCorp, but also many others who may not be known even to the Afghan government. The Afghan government's main complaints against the companies are lack of accountability, intimidation of Afghan citizens, disrespect of local security forces and companies that do not cooperate with authorities, according to a set of draft rules being debated by the Afghan government and obtained by The Associated Press. As many as 10,000 private security guards are estimated to operate in Kabul, the Afghan capital, alone, but the Interior Ministry, which is responsible for the Afghan police and domestic security, has little idea who some of the guards are, said the Western official. Paktiawal said more than 10 companies would be targeted for closure in raids police planned to carry out next week. "There are some companies whose work permits have expired, and there are some companies who have illegal weapons with them," Paktiawal said. 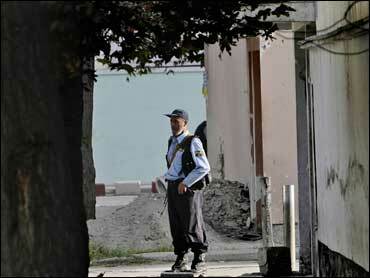 "We do not want such private security companies to be active in Afghanistan. It doesn't matter if they are national or international." The Interior Ministry said 59 Afghan and international security companies have registered with them, though the Western official said as many as 25 other security companies could be operating in the country. Some of the 59 companies are suspected of involvement in criminal activity like killing and robbery, and the police were investigating these cases as well, Paktiawal said. He could not provide the breakdown of how many of these companies are Afghan and how many foreign. The rules seen by the AP say the main problem faced by the government is the absence of "checks and balances" over the work of private security companies, known as PSCs. "In a compromise with the large international community, and its legitimate and high demand for security protection, the (Government of Afghanistan) has allowed for limited PSC operations and activities," the draft says. "However, increasingly, the absence of targeted regulation ... in parallel with unstable security environment has generated an unfortunate and nearly anarchical PSC market with a long series of security problems and criminal activities." Faced with growing Taliban insurgency, "it is a matter of urgency to regulate and monitor the activities of PSCs in a coordinated and precise manner and through a set of clear mechanisms," the draft says.